I grew up eating a lot of fresh corn on the cob! Nothing quite like it, YUM! Thankfully, my boys and husband also love it. 🙂 Usually, I peel them, then boil them for approximately 20 minutes. However, we’ve gotten into grilling it (in the peel) and it is so easy and delicious this way!!! Seems like it keeps more of its yummy taste. It’s now my preferred way of cooking/eating it! Soak ears of corn, with the husk on, in cold water for one hour. Place on medium heat on the BBQ. Turn or roll the ears occasionally and cook for around 15 minutes. 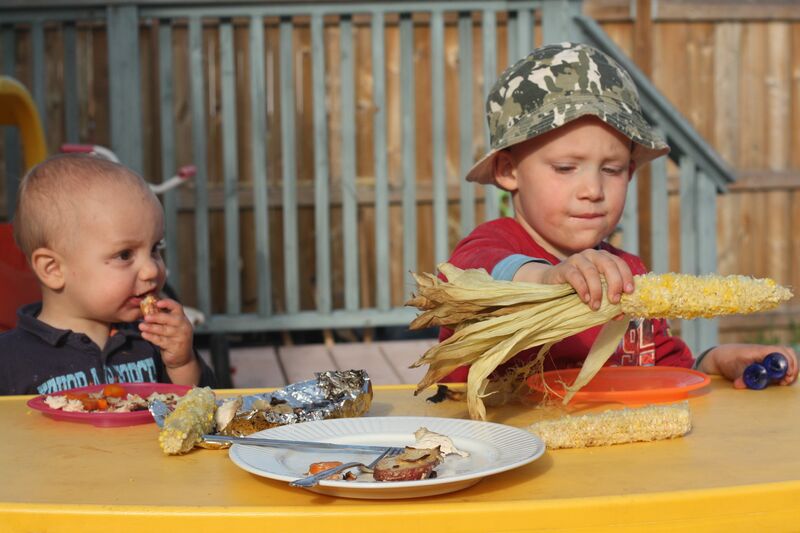 The peal will get dry, and crispy, and a bit burnt, but not the corn! Use a fork to check doneness. Kernels are soft when fully cooked. Peel back the husk and use as a “handle”, or take it off completely, and you’ve got yourself a yummy supper side dish. 🙂 We like to spread a bit of butter and sprinkle a bit of salt on ours.